Lotus temple is one of the most visiting landmarks of the world. It was founded by the followers of the Baha faith which can be seen purely in the temple where there is not any distinction and discrimination of the religion. As the faith is based upon three main principles of the unity of the God, unity of the religions and unity of the humanity, the lotus temple is open for everyone but one cannot perform any special celebration of a particular religion. The temple is only made for the worship where anyone can do the worship in his own way and this is the reason of calling it Baha’I’ place of worship. 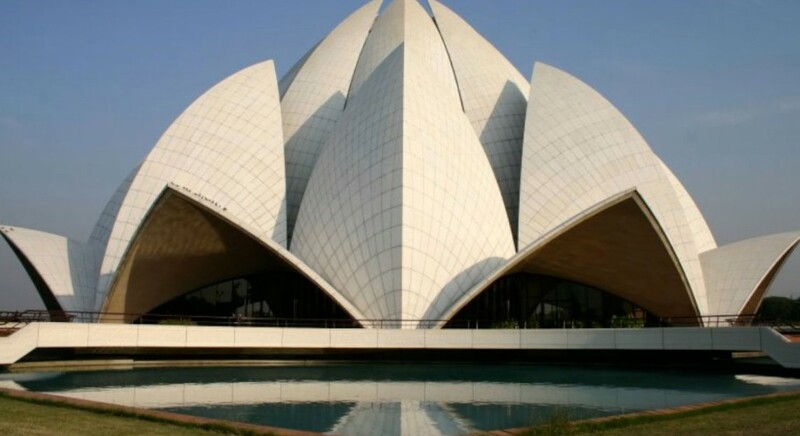 Being inspired from the attraction and the beauty of the lotus flower the temple has been made in the lotus flower shape with three big petals made up of white marble which had been imported from the Greece. The petals are standing in such a way that they form nine sides. Using this special material is common in all the worship places of the Baha’i’ faith. There are nine big gates to enter into the temple which leads to a same wide hall present in the center of the temple. More than 2500 devotees can sit at a time in the hall which is around 40 meter tall. The lotus temple is surrounded by water ponds and gardens making it an eye catching spot. The design was made by an Iranian architecture. The construction was the project of ECC construction group of Larsen and Toubro limited. It receives around 7 million visitors each year. The temple is worldwide famous for its amazing architecture and its religious importance. It has won various architectural awards among which some are of international level. There are number of publications for the temple including books and magazines.